This stretch is a combination of the backbend half moon and the forward fold good posture poses. Performing this daily will help correct any slouching or curving of the upper back, and be invigorating as well! 1 Start by standing with your feet hip width apart and perfectly parallel to each other (you may feel slightly pigeon-toed). Grab a towel in your hands with a comfortable distance between them. This is a bit of a dance with your breath, so each movement couples with a deep inhale or exhale. 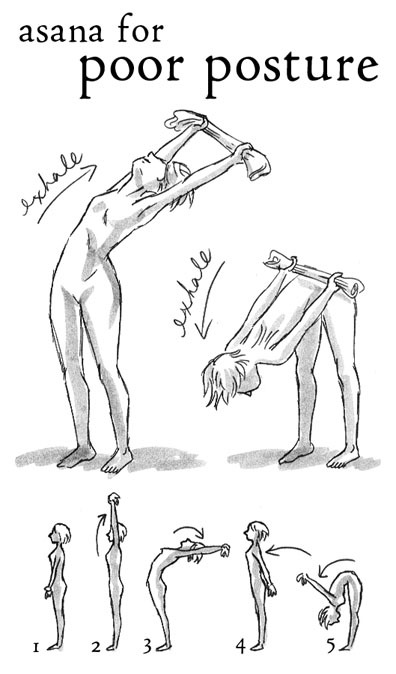 2 Slowly inhaling, swing your straight arms above your head, keeping the towel taut and your shoulders down. 3 Exhale while you bend back as far as you can, arching your back and lifting your chin. Don't crunch the back of your neck or your lower back, and keep your arms straight. 4 Inhale and come back upright, and bring your hands behind your buttocks, holding on to the towel and keeping your arms straight. 5 Exhale, bend forward, swinging your arms up perpendicular to your back. You can bend your knees slightly here, but keep your arms straight and the towel taut. Come back to your initial standing position with an inhale. Take a breath and repeat 2 to 4 more times. I will have try this should be able to even though recovering from surgery. umm...human arms don't bend that way. was this written/drawn by a cat? How would this improve posture? Strengthens your core, that's how. You can move your arms like this by broadening your grip on the towel/strap/blanket. 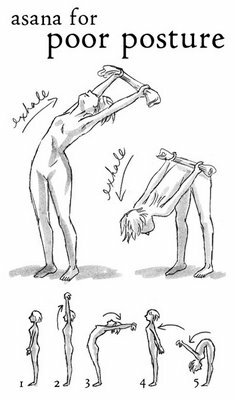 It improves posture by opening the chest, strengthening your shoulders and core. Don't lock your legs out! Did you know that you can shorten your urls with AdFly and get cash for every visitor to your short links. This is an awesome post.Really very informative and creative contents. These concept is a good way to enhance the knowledge.I like it and help me to development very well.Thank you for this brief explanation about posture.